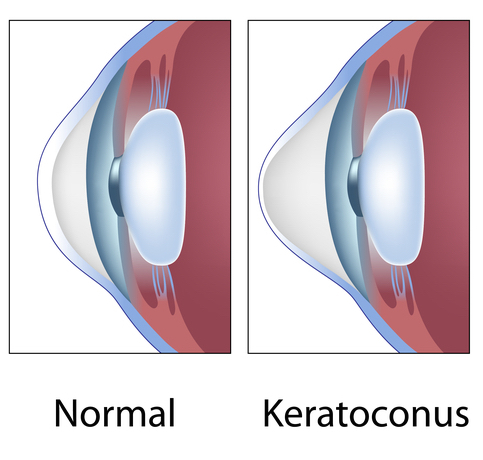 Keratoconus is a corneal disease that affects about 1 in 2000 people. This condition causes an irregular corneal curvature which can result in mild to severe vision loss. It most often begins at a young age and may progress into middle age. The cause is unknown but includes genetic disorders, eye rubbing, and contact lens wear. Dr. Gailitis is a Fellowship-Trained corneal specialist and can help you with treatment options. Glasses and contact lenses. In early keratoconus, these options may work well. Often times, the vision is not fully correctable. There are several specially designed contact lenses for keratoconus which may be advantageous. INTACS. Intacs are small half ring segments made out of a material called PMMA that are implanted into the peripheral cornea. Originally, they were used to treat mild nearsightedness. Later, they were found to help improve the irregular curvature associated with keratoconus. This option works best in patients with stable keratoconus. Click here to learn more. Collagen Cross linking.This procedure involves strengthening the cornea with riboflavin eye drops and ultraviolet light. This treatment works best in patients with progressive keratoconus but may also offer some benefits to patients with stable disease. It can also be combined with Intacs and/or laser vision correction. Click here to learn more. Corneal Transplant. This procedure involves transplanting an entire cornea from a human cadaver eye obtained from an eye bank. This is most effective in advanced stage keratoconus especially if there is corneal scarring. Click here to learn more.